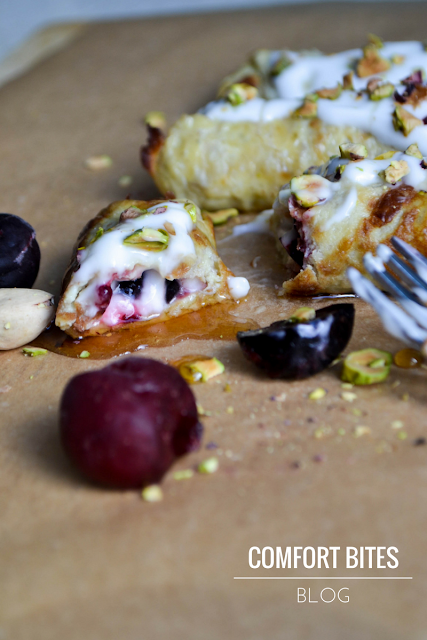 soft sweet cherries and crunchy pistachios... beautiful! This post contains some affiliate links. This means that if you decide to click on a link and make a purchase, I might receive a small commission that helps me keep the blog going. Thanks so much for your support. Oh my gosh how I love cherries. I love pancakes, too. And it was while I was making one of my Raspberry Pancake Stacks (video below) that I wondered how I could make it different AND include cherries. And then this was born. 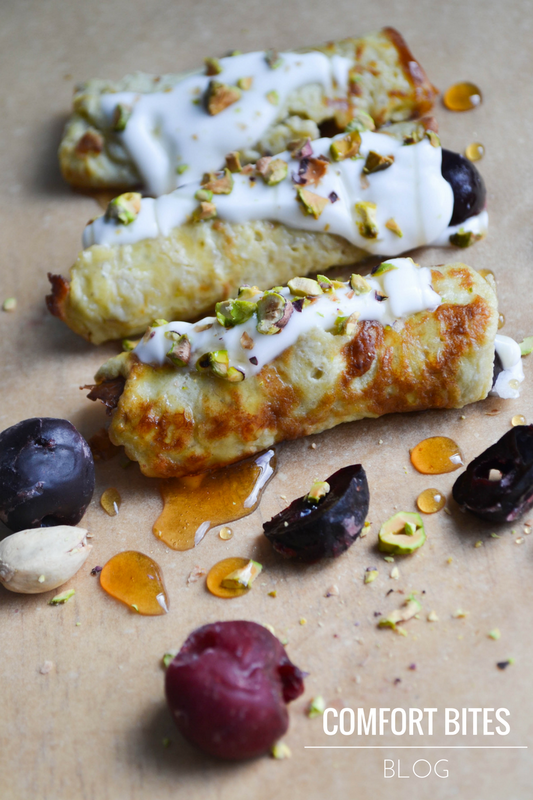 All you need to do is make a batch of my paleo pancakes and then roll it up with cherries, coconut yoghurt and sprinkle over some pistachios and maple syrup if you like it sweet and sticky. And, lets' face it, who doesn't? I'm ALL for the maple syrup, just so you know. Quick to make, easy to make and you will definitely love it. It's also posh looking enough to make someone think you spent ages on it. But you didn't. We'll keep that between ourselves, shall we? 24 ripe cherries, fresh or frozen, but with the stone and stalk removed. (I used frozen and let them defrost for a few minutes at room temperature). First, beat the eggs and the banana together, mashing the banana until smooth. Add the vanilla extract and beat together well. Melt the oil in a frying pan and, when hot, add 2 tbsp of the banana-egg mixture in dollops in the pan. 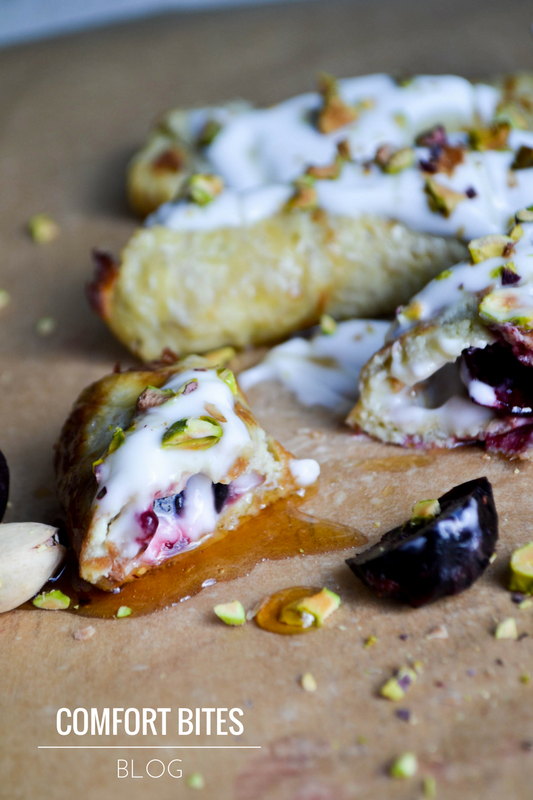 You'll need to make these in a couple of batches, so as not to overcrowd the pan. Fry for 2-3 minutes on one side and then flip over and finish cooking for a minute or two on the other side. Lift them out and place onto a waiting plate or board, while you make the rest of the pancakes. Once the pancakes are all made, take out a serving plate or board and lay out a pancake. 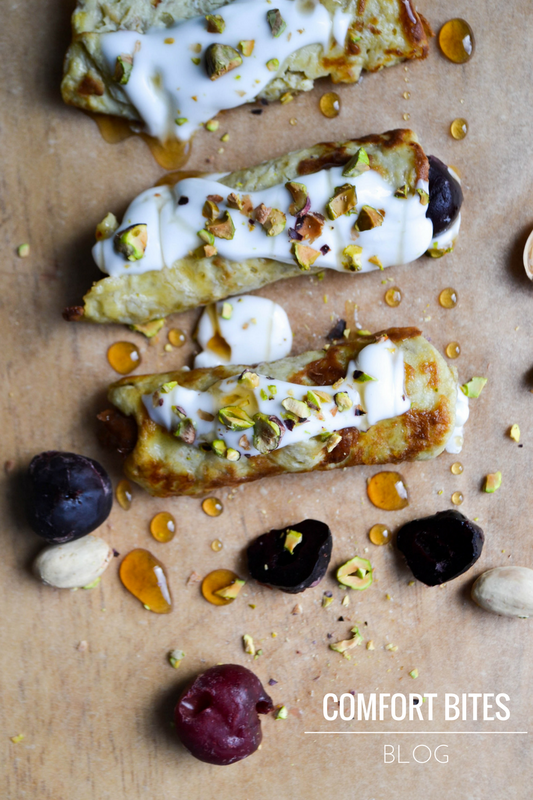 Line up three cherries along the middle of each pancake and add a scant teaspoonful of coconut yoghurt. Roll the pancake up, add more coconut yoghurt, drizzle with maple syrup and scatter with the pistachios. Repeat for the rest of the pancakes. You might also like my Raspberry Pancake Stack - video here!